Upon a hill in the town of Carini, near Palermo, a castle appears suddenly to people’s view. It’s the Castle of Carini, a medieval stronghold built at the end of the XI century by a Norman feudatory as a defensive building. Castle’s Medieval walls date back to the eleventh and twelfth centuries, but there are also some elements from the arab-norman culture like the pointed arches. Castle is divided into two floor: the ground floor, where there is a chapel featured by a wonderful wooden tabernacle dated back to the XVII century, and the first floor where it’s possibile to visit a beautiful party hall and to see the landscape of Carini. Tourists choose to rent one of our luxury villas in Sicily to visit this wonderful fortress, not only for its beauty, but also for the famous legend of the baroness of Carini. 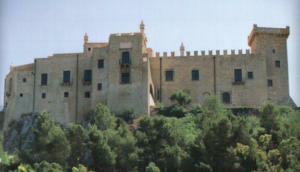 During the XVI century, the castle was inhabited by Laura Lanza and her family: Lanza di Trabia family. Laura was the firstborn and she was betrothed to an other noble, Vincenzo La Grua-Talamanca, as their fathers decided. They got married when Laura was just 14 and, probably by the forcing of that marry, she began a secret lovestory with her real lover: Ludovico Vernagallo. Laura and Ludovico stayed together for a long time until december 4th 1563, when Cesare Lanza, the Laura’s father, discovered the secret relationship. Because of desobeying, Cesare killed his daughter and her lover, destroying their lovestory. The legend tells Cesare used a dirk to kill his firstborn and, whit her bloody hands, Laura left an hand imprint in a castle’s wall. The noble family tried to hide the story and, although today this historical event is known, we don’t know other details. In fact, it is not sure that the father killed Laura and Ludovico with his proper hands, it is possible that he hired assassins to kill them. Other sources tell a different story, asserting that both Cesare and Vincenzo killed them. The legend also says that nowadays there is a wall in the castle with the original Laura’s bloody imprint and her ghost still wanders around the castle. We don’t know how events exactly took place and it is the reason why the story became a legend that inspired books, movies and songs.